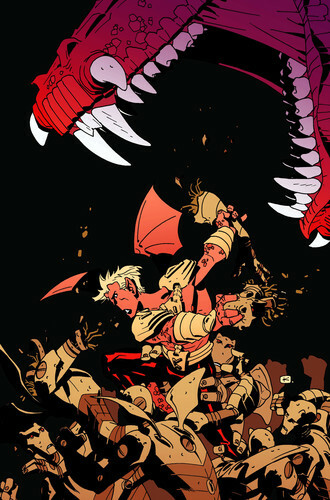 Firebreather is an on-going comic co-created by writer Phil Hester and artist Andy Kuhn. Published by Image Comics, the story of Firebreather began with a four-issue mini-series in 2003 and continued in a 2004 one-shot. The on-going series began in 2008 and serves a fine jumping-on point for new readers. Firebreather is about a high school student named Duncan Rosenblatt who is the son of a centuries-old dragon and a human woman. [Before you ask, no! I don't know how it's possible that Duncan has a dragon father and a human mother. Word is that the biology of it all will be explained somewhere around issue #10 in the on-going series.] Being a teenager with divorced parents has made life tough for Duncan. His mom wants him to do human things like going to school, getting good grades and going to college. His father, on the other hand, would rather he embrace his dragon heritage. Eager to appease both, Duncan attends high school every day as a social outcast and also trains to be a better dragon in the wilderness with his father. Firebreather has a lot of qualities in common with books like Invincible and Ultimate Spider-Man. The characters have a school life, family life, and a superhero life. It’s a classic formula. They’re just very good comic books. They’re comic books that every fan of superheroes should read because they’re just about as good as superhero books get. Also, Robert Kirkman commands it.